New Hampshire is home to several hundred Bosnians who started resettling here as refugees in 1993. This year, on Saturday, July 11, The Bosnian community and their friends, with support from the Association of Bosniaks of New Hampshire, gathered to remember a 20-year anniversary of unspeakable horror. 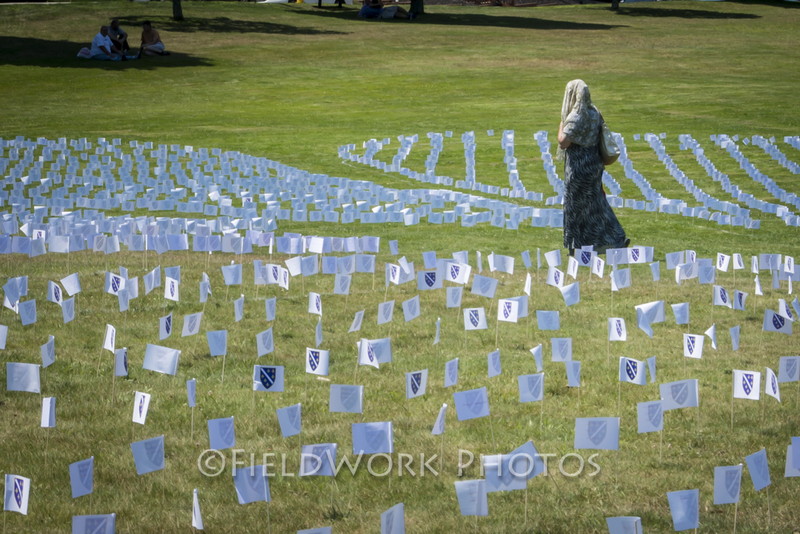 From the air it looked like a large white flower, but on the grass in Derryfield Park in Manchester it was a pattern of small white flags in neat rows. 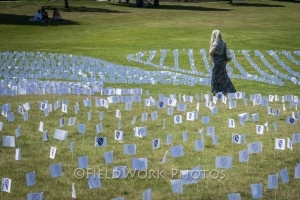 There were 8,372 flags, one side with the symbol of the Bosnian flag and the other side with a person’s name. 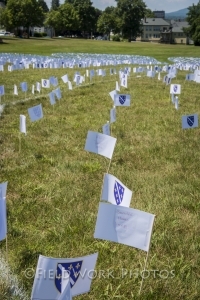 The flags honored 8,372 Muslim people massacred in the three-day genocide in and around the small mountain town of Srebrenica that began on July 11, 1995. During the Bosnian war, the United Nations had designated Srebrenica as a “UN safe area.” The town’s population swelled as people desperately sought refuge from the war. On that July day 20 years ago, the Serbian military swept in, massacring Muslim men and boys as the outnumbered UN troops looked on helplessly. Many who escaped into the woods were hunted down and killed. Two UN courts have ruled the Srebrenica massacre as genocide, the worst in Europe since the Holocaust. Although the Serbian governmental leaders and the military were directly blamed, the United Nations has also acknowledged its own negligence and the failure of the international community to protect the Bosnian people. Twenty years later in Derryfield Park, children ran about on the grass in the warm afternoon sun as adults gathered near the rows of flags. In sharp contrast to the tranquil scene, voices rang out as young adults, one by one, read horrifying stories from NH survivors of that day. I noticed a young boy, about 12, sitting on the grass with his mother near one of the flags. He pulled the flag out of the ground and pressed the side with a name against his heart. He glanced up at his mother. She leaned over and gave him a kiss on his forehead. I am grateful that New Hampshire provides a safe home for Muslim families from Bosnia. I am often asked why and how I started this project to photograph immigrants and refugees in New Hampshire. The inadequate answer is I really don’t know – it was like the proverbial light bulb going off over my head. Yet I can point to the convergence of two events that got me going. In the fall of 2011, I enrolled in the photography program at the NH Institute of Art. To graduate, I needed a coherent body of photos. 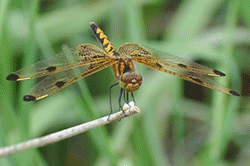 I was inspired by the work of Photography Department chair, Gary Samson, in Ghana and Cape Breton Island. His images of people in their environments are both artistic and profound. That same fall, malicious graffiti was scrawled on the homes of four refugee families in Concord, NH. I was appalled with such a hateful act against families who had escaped violence and resettled here for a better future; one family was so frightened that they left New Hampshire. I decided then to use my photography to honor New Hampshire’s recent immigrants. I spent the first year making connections with immigrant families and events. My camera and I went to English and citizenship classes. I met parents with adorable children, senior citizens with faces lined with time, and young adults wanting to share their own culture while embracing a new society. With each contact came more connections and the project quickly grew. Soon I was invited to homes, family parties, traditional celebrations, and sacred services. I have received abundant cooperation and interest from the immigrant families, communities and organizations. I have been welcomed, even urged, to attend private and public events. The people seem to understand the message of my work – that though we may be different in many ways, we have the same dreams, to have safe families, meaningful jobs, and freedom to practice our cultural and religious traditions. One of my first photo shoots was with the Bosnian community in Manchester at a presentation of traditional dance, music, poetry, and song. This was the first time that the Bosnians had performed for the NH public while also teaching these traditions to their young people. Earlier this month (6/3/15) the NH Senate passed a resolution (NH SCR 1), requesting the U.S. Government to work to resolve the Bhutanese refugee crisis, repatriate their refugees, and promote human rights in that country. Why, you ask, are NH senators concerned about refuges in this small South Asian country 7,500 miles away? The Bhutanese community is the largest ethnic group of refugees currently in New Hampshire, 2,091 people resettled here between 2008-2014. The Senate resolution was the result efforts by the NH-based nonprofit, International Campaign for Human Rights in Bhutan, and Manchester resident, Suraj Budathoki, Executive Director. That Senate resolution recognizes the contributions of Bhutanese in New Hampshire. You may have seen some of our Bhutanese neighbors around town – women in colorful saris, men wearing small patterned hats (topis), or their children in our schools. In the last two years, two Concord High School seniors from Bhutanese refugee families have won the highly competitive Bill and Melinda Gates Millennium Scholars Award with college scholarships. Although having Bhutanese ethnicity, the families had lived some 25 years in refugee camps in Nepal. Starting in the 1980s, the royal government of Bhutan dictated that southern Bhutanese, whose ancestral roots were Nepali, should denounce their customs and strictly follow the traditions of the northern Bhutanese. Protests and violence erupted during the 1990s. The government militia closed the southern schools, burned down homes, attacked women, and killed protesters. The southern people fled to Nepal where their numbers in the squalid refugee camps swelled to more than 107.000 by 2008. Eventually the United Nations recognized their plight and started relocating the refugees to other countries. For more, I highly recommend the documentary movie, Refugees from Shangri-La, directed by Doria Bramante and Markus Weinfurter. 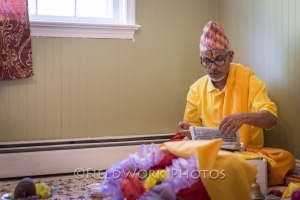 Through my photography project, I have been invited to many homes of NH’s Bhutanese families. 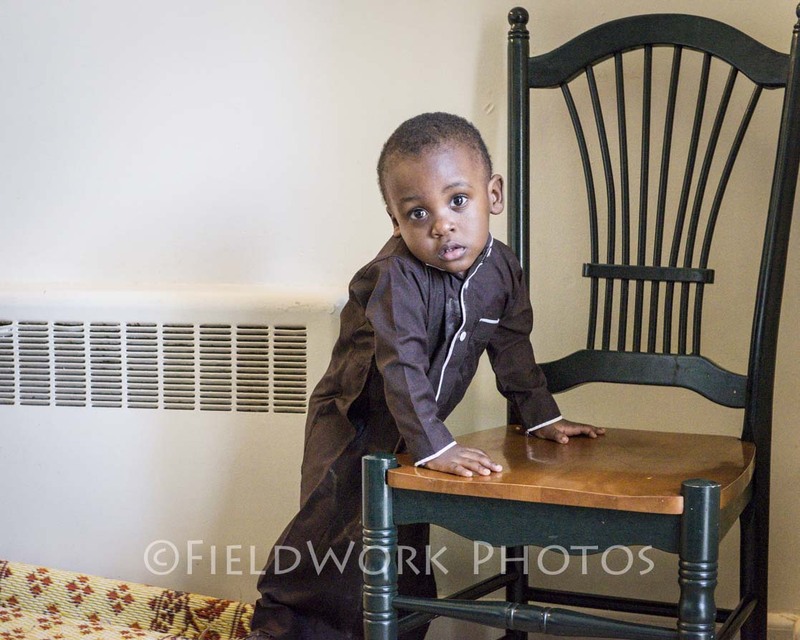 I have photographed baby-naming ceremonies; hair-cutting traditions for young boys; religious ceremonies; high school, college and graduate school graduations; and several Hindu weddings. These families continue to show me that while we may be different in many ways, we all have the same dreams to have safe homes, bright futures for our children, jobs that sustain our families, and freedom to practice our faith and cultural traditions. 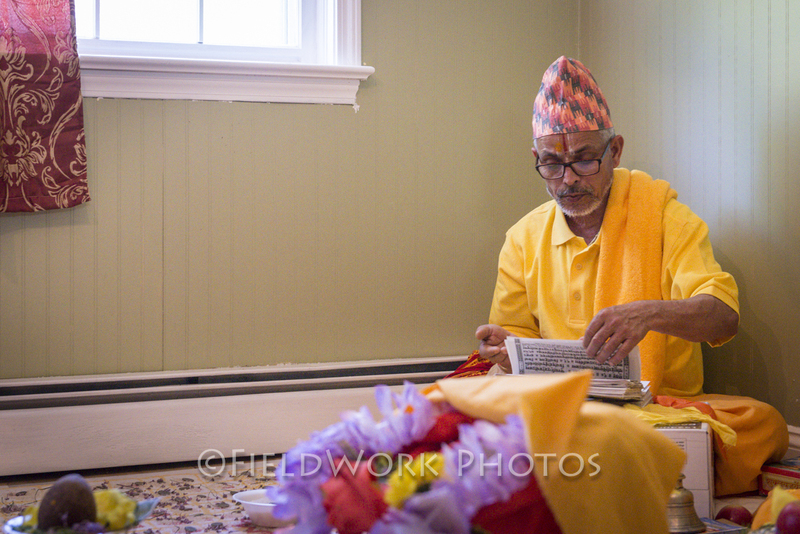 A Hindu priest reads a holy text during a Bhutanese house-blessing. I am excited to be writing this – the first blog for the website of my photography book about New Hampshire’s immigrants! Different Roots, Common Dreams: New Hampshire’s Cultural Diversity, will showcase photographs of immigrants (many of them refugees) that I have taken over the past three years. There will also be information about immigration in New Hampshire and stories of resettling in this state written by NH’s immigrants. The book will be released in the Fall of 2015. This book is not just mine. I took the photographs, but the book really belongs to the immigrant families in the Granite State. They are the ones who generously invited me and my camera into their lives. They are the ones who have shared with me the joys and difficulties of their journeys to get here. They are the ones who have strengthened our towns and cities with cultural, ethnic and religious diversity. I hope my photographs will last as an historic snapshot of immigrant communities in our state at this point in time. These families are part of a long legacy of newcomers to New Hampshire. Immigrants came from England and Scotland in the 1600s and 1700s; from Ireland, Canada and several European countries in the 1800s and early 1900s; and recently from Bhutan/Nepal, Burma, Burundi, Democratic Republic of the Congo, Iraq, Rwanda, Somalia, South Sudan, and many more. Immigrants have made contributed to our state with a diversity of ideas; determination to secure a safe future for their families; clear focus on education for themselves and their children; and contributions to New Hampshire economy through jobs to support their families. We are lucky to count foreign-born residents among our friends and neighbors. I will say more about the book’s contents in the next blog – so stay tuned! I will also share an occasional favorite photograph (they are all my favorites!) with each blog. A young Burundi boy in Manchester is dressed up for a wedding.